The inverted umbrella is uniquely innovative, while the elements that compose it and their style are identical to the classical models. 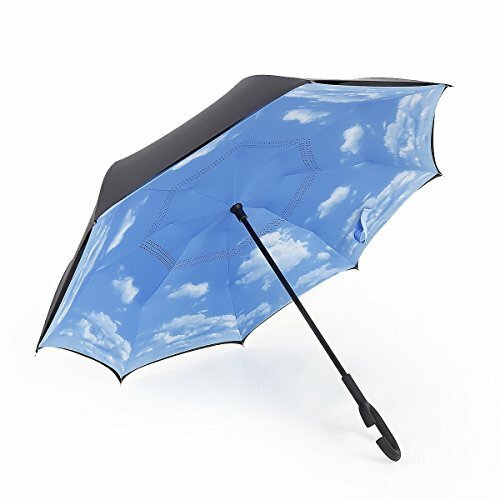 The main difference is that the frame is mounted on the other hand, this means that the frame is on the outside and the umbrella opens in reverse. 1.In use, our umbrella functions the same way in the same structure as typical umbrellas do when open all the way. 2.Opposite from other umbrellas, the lining opens outward when the umbrella is folded. 3.In result, the wet side folds inward and dry side outward, you can keep your clothes nice and dry. Measures 31.5 inch(80cm) long and 41.3 inch(105cm) in diameter when open.It's large enough to shelter both you and your loved one from the downpour.